Since Hideaki Kawashima held his first solo exhibition at Tomio Koyama Gallery in 2003, he has continued to develop his abstracted portraiture. In his paintings, the subject’s face alone floats lightly in the air against a plain background, with long trailing hair that seems to express something of the unearthly allowing us to imagine more a human soul than a human being. The Artist has identified himself with these portraits. However, from around 2010, wishing once more to return a overly bloated self-consciousness away from such intensely inward-gazing introspection to neutrality, he began to turn his perspective towards other people. The subjects of his portraits each possess a sense of body: each is painted with distinct hair-styles and clothing. As if rendered in ideal model form, it is as if in each their full personality has been released. 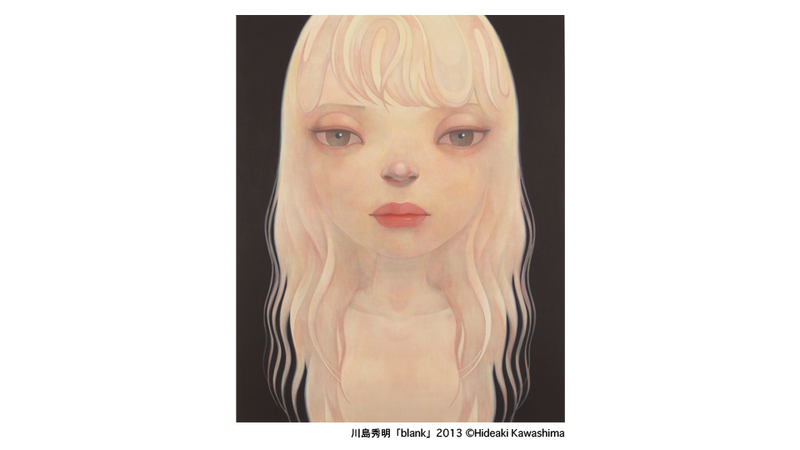 Now that 10 years have passed from his first solo exhibition, the work of Hideaki Kawashima is again changing. From 1995, Kawashima undertook 2 years of training with the esoteric Tendai Buddhist sect at the Hieizan Enryakuji Temple. He says that he recently often recalls the words spoken by Saicho which he encountered during this period: "Brighten the world at your corner", meaning "Devote yourself to doing your best in every position you hold". Perhaps these words have given the artist something of his particular kind of freedom and strength of spirit. His subjects are untied from their characteristic colours, their outlines liberally deformed, truly putting into practice the notion of ‘creating a picture’. This exhibition is entitled "come out". For the exhibition, which is the first one since the artist's last solo show at Tomio Koyama Gallery in 2008, Kawashima will present fresh approaches. Hideaki Kawashima was born in Aichi, Japan in 1969. He graduated from the Tokyo Zokei University in 1991. He currently lives and works in Tokyo. Selected group shows include "Takahashi Collection, Mindfulness!" (Kirishima Open-Air Museum, 2013, and other venue), "Portrait Session" (NADiff, Tokyo / Hiroshima City Museum of Contemporary Art, 2007), "Life" (Art Tower Mito, 2006), "Idol!" (Yokohama Museum of Art, 2006), "Little Boy" (curated by Takashi Murakami, The Japan Society NY, 2006), and "Japanese Experience Inevitable" (Museum der Moderne Salzburg, 2004). As well as these numerous shows in both international and domestic institutions, he also exhibited at the Pochon Asian Biennale in Pochon, Korea, in 2007. Hideaki Kawashima was selected as an artist for The Official Art Print Edition 2014 FIFA World Cup Brazil™. In a poster project in which FIFA has selected 23 artists around the world to make posters themed on football, life in Brazil, and festivals, Kawashima’s work has been chosen along with that of such historically significant artists as Jean-Michel Basquiat and Keith Haring.